Jaypee Institute of Information Technology (JIIT) located in NOIDA, Uttar Pradesh, India is a Deemed University offering programs in technical education at Under-graduate and Graduate level. Jaiprakash Sewa Sansthan (JSS), a not-for-profit division of the Jaypee Group runs the University and various other educational institutions in the country. JIIT is situated adjacent to the Electronic City at NOIDA and is at a distance of 3 km from the New Delhi – UP border. The state-of-the-art campus was built at a total project cost of Rs 7500 lakhs (Rs 750,000,000), with a total built up area of over 650,000 sq. ft (60,000 m²) comprising of buildings with internet connectivity (air conditioned Academic Block, and environmentally conditioned Faculty Residences, Student Hostels and Annapoorna (the college mess)), well-equipped modern laboratories as well as the library (Learning Resource Centre-LRC). Learning Resource Center is the backbone of academic activities of the Institute. LRC houses a collection of around 22000 volumes of books. LRC holds 22 journals, 16 news dailies, 20 magazines and 300 CD-ROMs.The library is linked with DELNET (Developing Library Network), the users of LRC enjoy the access of reading materials through this network also. The library subscribes to journals of national and international repute. LRC users can access online journals of IEEE, ACM and Springer through the consortium, INDLST (Indian National Digital Library in Science and Technology). The library is fully classified and cataloged and users can search for information at their own. The institute uses a Library management software, Alice for Windows . LRC users know the availability status of the books and other materials through the software OPAC (Online Public Access Catalogue). Photocopying, CD/DVD writing facilities are also available within the library for user convenience. The library has a spacious reading room area, a comfortable sitting arrangement in reading room encourages the readers to spend more time in the library. 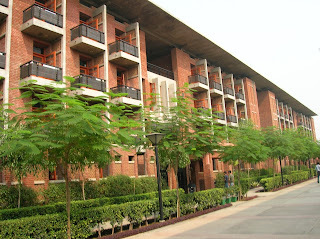 The campus presently has the separate hostel facilities for boys and girls. There are 3 hostels for boys and 1 hostel for girls. The administration of hostel is administered by a faculty member for boys hostel and girls hostel respectively as the Hostel Wardens. The overall charge of student's discipline and hostel administration vests in the Chief Warden. All the hostel rooms are provided with LAN connectivity with 24 hours internet through the main server of the academic block. reading rooms and additional sports facilities like table tennis rooms, chess and carrom rooms. The hostel is also connected with outdoor sports centers for lawn tennis, basketball, volleyball and badminton. The hostels are equipped with generators in order to provide 24 hour's electricity supply, water heaters, water freezer etc. The Campus has been networked for total connectivity. Its server room has Nine servers Compaq Alpha ES450,Compaq Proliant dual XEON Processors Servers ML370 and Compaq Proliant single Pentium Server ML330,ML350. Switching has been implemented through the latest layer 2/3 CISCO switches and Cisco 2620 Series Router. It has four Computer Laboratories with about 450 nodes operating on UNIX/Windows 2000 Professional/Linux/Windows XP. All the 4 computer labs are equipped with latest technology hardware and software. Other labs are Biotechnology Lab (9000 sq mt), Analog & Digital Communication Lab , Instrumentation Lab, Machine Lab, Control systems lab, Electronic Design lab (uses MATLAB and VHDL), Microprocessor Lab (equipped with Intel 8085,8086 and 8051 kits helps the students to develop the necessary confidence in Assembly Language programming ) and a well equipped physics lab. The M.Tech labs are equipped with state of the art facilities like LAN Trainer, CDMA Trainer, Antenna Trainer, Mobile Communication Trainer etc. The university provides a pleasant and intellectually stimulating ambience for students in an eco-friendly environment. M/S Arcop Associates Pvt. Ltd., an eminent Canada-based architect firm, has done the architectural design of the campus with the construction being undertaken by the Jaypee Group itself. The syllabus is continuously updated as the need of the outside market changes. Continuous feedback from the companies also adds to the updating process. The institute has an excellent placement record. Every year many companies come to JIIT to appoint the students. This Year almost 95% of the passing out students have been placed in companies by campus recruitment. I'll give you the detailed scenario of placements of the 2006 batch and 2007 batch in the next post. I need a information about the companies that came to the JIIT,Noida for placements.